Welcome to MyBinding Video. 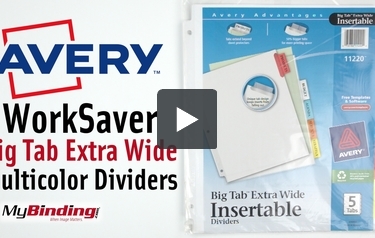 These are the WorkSaver Big Tab Extra Wide Multicolor Dividers from Avery. Each set of dividers comes with a sheet of perforated inserts you can print out using templates from Avery.com. They fit perfectly in the 50% larger tabs and clearly display the chapter title. Each divider is made with clean white paper, durable multicolor plastic tabs and a laminated reinforcing strip on the binding edge. This pack includes five dividers and one sheet of inserts. For more videos and all your binding needs, visit MyBinding.com.